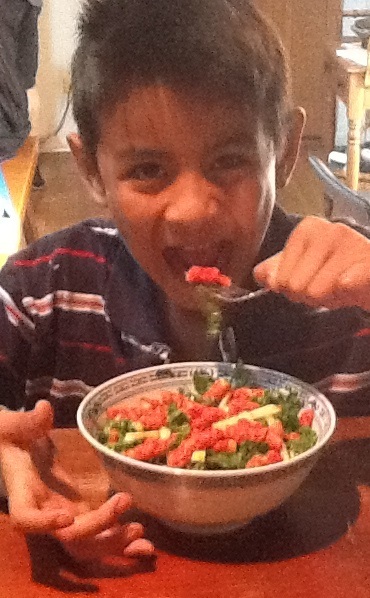 Is it ok to feed kids Flamin Hot Cheetos on a kale salad? Hot Cheetos top a lemony kale salad. Is this the perfect blend of delicious with nutritious? Do healthy eaters have to ditch Flamin Hot Cheetos forever? This hypothetical food combo cracked up Morning AMp co-host Brian Babylon so much that he insisted (over and over) that I give it a try. And so, last weekend, I did. Once home with the contraband, we chopped the fresh kale (tender younger leaves work best), tossed it in a dressing (olive oil, lemon juice, vinegar and mayonnaise), showered it with apple matchsticks and then topped the whole thing with Cheetos crushed gently in a paper towel. Our eight-year-old and ten-year-old sat at the counter squirming with impatience for the Christmas wreath-like creation. And when they finally got their forks into it, there was no going back. They might have devoured the entire bowl if I hadn’t explained that I needed to try it, too. When I finally did, I understood their enthusiasm. The citrus tang of the dressing, vegetal bite of the kale, sweetness of the apple and the spicy, corny crunch of the Cheetos brought these foods from the opposite sides of the health universe into perfect balance and harmony. Ideally, kids would eat kale salad without the Cheetos. But if some day-glo croutons can get youngsters to scarf down bowls of nutrition-packed kale, perhaps the ends justify the means. I might even eat the combo again myself—when no one’s looking.